Hailing from Akron, Ohio (home of Lebron James and The Black Keys) ShiSho are real life sisters (Vivian and Midge Ramone), aged 16 and 13. They’ve been recording together for 9 years. Yeah, I know. I want to hate them. I really do. But they are just too damn good. 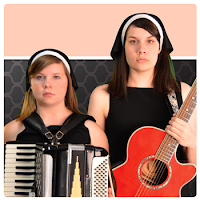 At first their songs are adorable and cutesy girly pop with accordion, guitar, and ukulele. “The Dead Milkmen Song (featuring The Dead Milkmen)” consists mostly of lyrics from Dead Milkmen songs, which immediately makes your own children seem inferior. Oh, and the Dead Milkmen play on the song. “Shrouded in Silence” captures adolescent angst and awkwardness perfectly, probably because they’re in the midst of it. Sure, they’re literally children, which is kind of odd. But they have the seal of approval from both Dr. Demento and The Dead Milkmen, and do you really need anything more?